Front and Rear Hub Motor Kits with PANASONIC 36V 11.6Ah rack battery in powers of 200W, 350W & 500W. This range of conversion kits uses a 36V 11.6Ah rack battery with PANASONIC cells. It uses a new beautifully crafted rack battery that slides into a custom designed double layered carrier rack. There is a controller box at the front of the rack that has room for our new micro controllers for a neat finish. 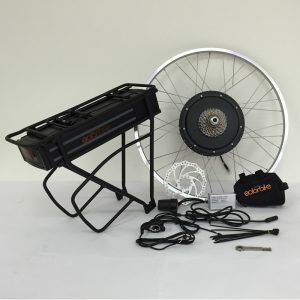 This kit is often used for ladies’ or step through bicycles that have no room for a battery mounted within the frame. 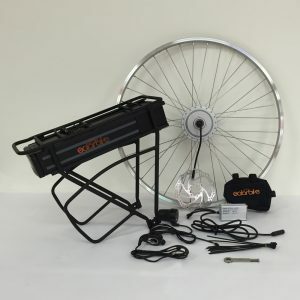 The kits are complete with everything you need to convert a regular bicycle into an electric bicycle. They are available in a variety of rim sizes and power options. 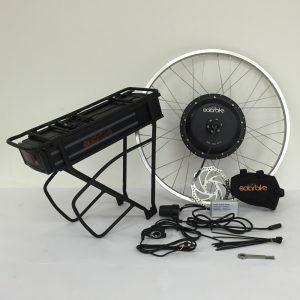 This is a simple conversion kit to install on a regular bicycle and is extremely lightweight. 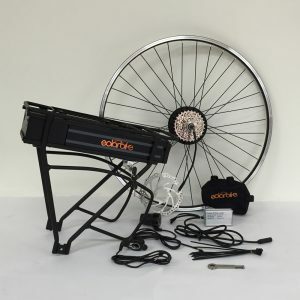 It’s a great option to convert a regular bicycle into a high performance electric bicycle. The battery can be used with 200W, 350W and 500W motors, keep in mind that 200W is the legal limit for riding on the road.